It cannot be easy to think about what to pack in multiple dabbas kids have to carry to school. Couple of snacks and one main meal which is easy to eat and will taste good even when cold. That is a Herculean task if I know one. With kids being as demanding as they are, it is a good thing to have a small pool of ideas. 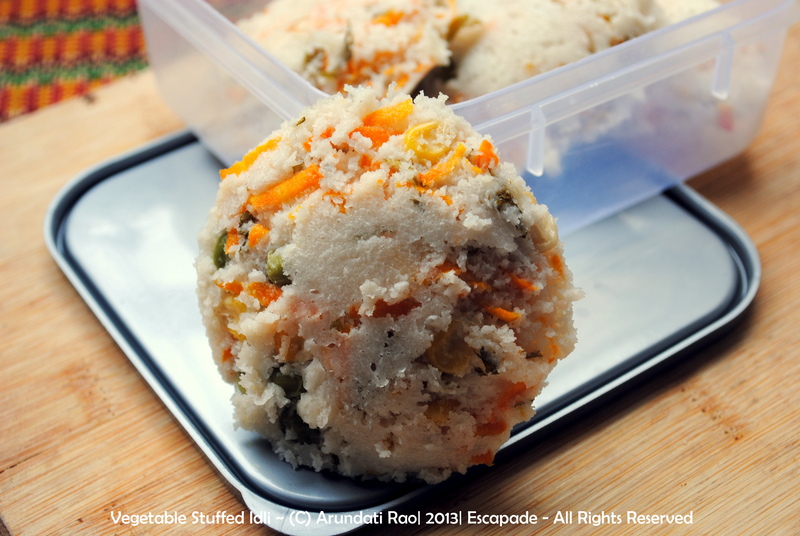 With the basic formula of variety, colour and balanced nutrition, these vegetable packed idlies can be easily made for those lunch boxes, or even breakfast for a fussy child or adult! Add all the ingredients to the idli batter. Add a cup of water to a steamer or a pressure cooker and heat till the water comes to a gentle boil. Put the batter into the idli plates and steam (without the whistle) for 15 minutes, reduce the heat and steam for another 4-5 minutes. Turn off the heat. Allow the idlies to cool, remove from the mould and pack into a lunch box with a little chutney or tomato ketchup.